The estate, surrounded by vineyards and fields, is located in the southern part of Tuscany, in the heart of the Maremma area, only about 5 km distant from the sea. The property is excellently situated. The area is only an hour drive from Sovana. Nearby, you will find Saturnia, with its famous hot springs, and the medieval centre of Capalbio. The most beautiful art cities of the areas, such as Rome, Florence, Pisa and Siena can be reached in daytrips. The Natural Uccellina Park and Marine Argentario Park are only about 20 minutes drive away. The luxury Villa offers enough place for up to 14 persons and has 7 suites. Each of the 7 suites has a living area and a double/twin room with en-suite bathroom equipped with bathtub and shower. The Manor can accommodate to sleep in total a maximum of 20 people between adults and kids, that means 12 of Guests adults plus 3 kids 3-16y and up to 3 kids 0 – 3y and 1 couple of personal staff or baby sitter accompanied by the Guests. On the ground floor there is a professional kitchen, a living area with open fireplace and a breakfast/dining area. Outside there is a beautiful Italian garden with pool as well as a parking area. 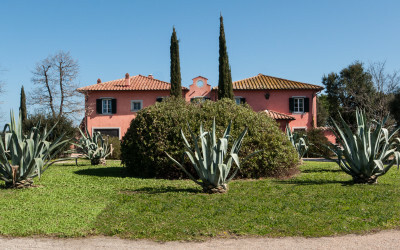 Villa Saraceni is located very peacefully, surrounded by fields. The villa includes all comforts for its guests. It is an ideal place for everybody who wants to spend a peaceful vacation in Tuscany, not far from the sea, but also close enough to interesting villages. A perfect combination of culture and relaxation.